At the age of 22, after her initial training in traditional Psychology, Samvedam’s interest led her on a personal pilgrimage to Tibet. Fascinated by what she learned and experienced there, Samvedam remained for several years in India studying Eastern approaches to inner growth and transformation. Living in the Shree Rajneesh Ashram and practicing meditation under Osho’s guidance opened new horizons for her. Upon completion of her training as a psychologist back in Germany, Samvedam came to the United States. She studied Postural Integration on the West Coast and in 1987 came to the Boston. There she began working at a clinic for dually diagnosed individuals, using traditional therapy. In time, she began integrating the transformative approaches she learned in India, with excellent results. She developed a full private practice and continued to study new approaches to help clients live from a place of inner wholeness. 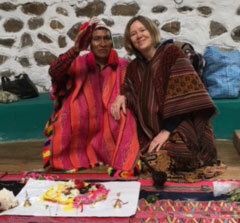 Working with indigenous elders in Peru. Samvedam’s present work incorporates training she undertook in the 1980s and 1990s with Dr. Salvador Roquet. A highly regarded Mexican psychiatrist and psychoanalyst, Roquet utilized healing practices shared with him by the shamans of the Mexican Sierras. He trained and worked with a small group of American therapists in the Boston area called Agua Viva Associates. Early in her career Samvedam embraced the body-oriented approach to psychotherapy. The work of German psychoanalyst Wilhelm Reich, which combines directed breathing with deep tissue massage, influenced her strongly, along with the movement-based approach developed by Alexander Lowen known as Bioenergetics. She became certified by the National Board for Therapeutic Massage and Bodywork. Subsequently, she co-founded the Center for Body Oriented Psychotherapy in Somerville, Mass. with her colleague Alex MacMillan to promote body oriented psychotherapies. Transformational Breathwork, a process of addressing “stuck” emotions and dysfunctional patterns of living, also attracted Samvedam as a therapist. She had experienced the power of breath to calm and focus the nervous system in India, and was on the forefront of the movement to bring breathwork to individuals in the United States who were seeking answers to depression, anger, relationship challenges, or addiction. Samvedam became a breathwork facilitator in 1993 and for six years served as a trainer of at the International Breathwork Institute in Boulder, Colorado. She eventually developed her own method fusing Indian and shamanic practices, and has trained facilitators in Boston and across New England since 2003. Breathwork is part of every Inner Arts Institute retreat, and Samvedam also facilitates individual breathwork sessions for many clients. In 2006, Samvedam began leading sacred journeys and Vision Quests to assist others in expanding their consciousness through a blend of inner and outer adventures. Apprenticeships with shamanic teachers John Perkins and Llyn Roberts in addition to her training with Dr. Roquet had made her a skillful guide. Inner Arts Institute groups have traveled to Mexico, Bimini, Costa Rica, the Sahara Desert, and the Badlands of North Dakota. Plans are in the works to offer private Vision Quest retreats in the countryside surrounding Boston in 2017. Samvedam was among the first psychologists in the U.S. to be certified in Family Constellations work, a powerful transformational method pioneered by the German psychologist Bert Hellinger and widely practiced in Europe. A graduate of the Hellinger Institute, Samvedam has studied with renowned teachers like Bert Hellinger, Hunter Beaumont, Gunthard Weber and Stephan Hausner. In 2002 Samvedam introduced Family Constellations work in the Boston area and founded FamilyConstellationsBoston.com. Since then she has facilitated hundreds of Constellations and trained numerous new facilitators in the art of Constellation work. In 2013 she presented her approach of combining Constellation work with shamanic practices at the U.S. Conference for Systemic Constellations in Seattle. 1983. Completed training as a psychologist at Wilhelms-University in Germany. 1984. Certified in Postural Integration. 1988. Co-founded the Center for Body Oriented Psychotherapy in Somerville, Mass. 1993. Certified in Transformational Breathwork. 1995–2001. Trainer for the International Breathwork Institute in Boulder, Colorado. 2002. Graduated from the Hellinger Institute USA, bringing Family Constellation work to Boston and founded FamilyConstellationsBoston.com. 2003. Began training breathwork practitioners in Massachusetts. 2006. Founded the Inner Arts Institute; also began leading Journeys of the Spirit/Vision Quests. 2013. Presented at the U.S. Systemic Constellation Conference in Seattle. 2015. Invited as a return speaker to the Systemic Constellation Conference. 2015. Created the Inner Arts Travel Team, bringing workshops on Breathwork and Family Constellations to communities across New England.